farmer will cut off the Scapes to allow the Garlic bulb to grow. Leaving the Scape diverts the plant's energy from forming a bulb to forming seeds. The Scape usually appears in June in our area about one month before it is time to harvest the bulb. The Scapes alone are very tender and edible with a taste that is milder than that of the clove. To learn more about the Garlic Scape read here. Store Garlic Scapes (unwashed) in the refrigerator for up to one month (sometimes more). Wash before preparation. Garlic, in general, is a great source of Manganese, Vitamin B6, Vitamin C and Selenium. It has ties to many health benefits including the lowering of Cholesterol and Blood Pressure and preventing Heart Disease and various types of Cancer. Click here to learn more. 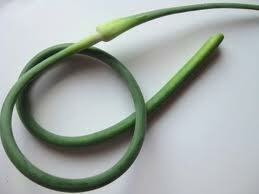 Garlic Scapes can be eaten raw, sauteed or grilled. To cook them we suggest cutting them into uniform pieces and either grill or sauté in your favorite oil. They are a great addition to a salad, pastas, stir fries and an omelette. Garlic Scapes are often used as the back bone for a pesto sauce.